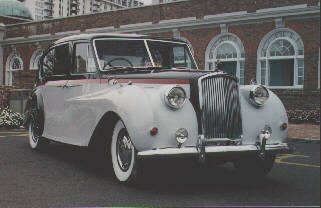 This 1962 Austin Vanden Plas Princess was given to us as a gift by Sir John Dowdle the Benificent. The Austin Princess line began life in 1947, when the then independent British subsidiary of Vanden Plas, a Belgian coach maker, joined Austin as a subsidiary and teamed their saloon coach to an Austin rolling chassis. Rolls Royce had declined to embrace the 1947 coach design for their post war Silver Wraith chassis as they chose instead to lionize their newly acquired H.J. Mulliner subsidiary and just about everyone else. The line, first known as the A120, then A135 when it got a larger engine, added the long wheelbase limousine version in 1952 and went through one minor body change and numerous other small mechanical improvements through 1957 and continued production as the Princess IV until 1959, when it became known as the Vanden Plas Princess, with only the limousine body being produced until 1968. Assembly was initially handled by Austin, which became BMC, but later was completely taken over by Vanden Plas, at which time the Princess name became attached to a number of other Vanden Plas models, creating some confusion that reigns today! 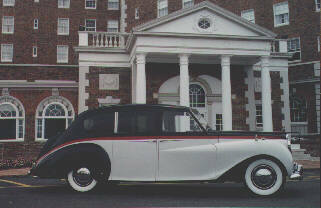 The Princess was the most quantitatvely manufactured limousine by any British Company by the end of its run in 1967. More Princesses were shipped overseas than stayed at home and it was the most quantitatively imported commercial limousine to the United States; Rolls Royces were generally the purvue of wealthy private citizens. While most Americans think the British Royal Family is a Rolls Royce family, actually they are a Princess and a Daimler family, having owned no less than ten Princesses. People often mistake the Princess for a Rolls, which tended to lead to some chicanery when American limousine companies (and many individuals) were selling their old worn out Princesses (Rolls radiator grille shells and Sykes Bronze (Flying Lady) kits were popular.) 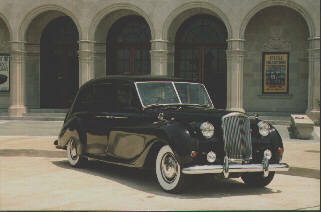 Rolls operators tend to scoff at it as that "taxi" (Austin also makes the London Taxi!) 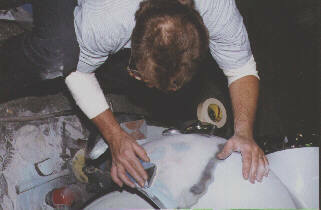 But Rolls's tend to be eccentric, ponderous and expensive in their maintenance and repair. The Princess is both simple and strong (Austin also makes trucks) and always outperforms the Rolls in durability and dollar operational cost in commercial environments. The Princess is a wooden coach body with aluminum door, roof, fender and tail skins; not because it was high tech, but because steel was rationed in post war England and hence was far more expensive! The '57 to '68 R4 Models are fitted with 4 liter in-line sixes and either a 3 speed standard or a licensed GM hydramatic type 1 (4 speed automatic,) same as Rolls's of that era. Princesses were routinely fitted with hydraulic wheel jacks which can generate some excitement in public places. 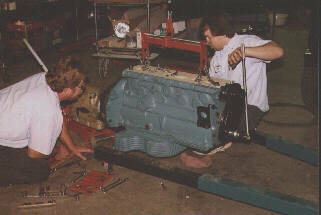 Power steering rams were rare and desireable. GM AC was generally fitted to American exports (in America.) Very few commercial operating examples of Princess exist today, especially in the excellant condition of this particular car. Note that a more roccoco paint scheme has been chosen for this vehicle rather than the traditional all black.